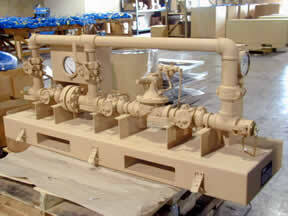 JGB Enterprises, Inc. manufactured these Back Pressure Regulator Unit Assemblies. Each unit functions to return water, pumped by a 50 gpm pump, in excess of consumption back to a collapsable fabric tank. This maintains a constant water pressure for varying consumption rates.